If you need any proof of the universal love of pomegranates, just have a look at Pomegranate Festival in Azerbaijan. The 12th Pomegranate Festival was held in Goychay on November 3-4. Marvelous concert programs with the participation of famous singers, exhibition, dance performances mesmerized festival's guests. Gorgeous national dresses presented by the head of National Center of Costumes Gulnara Khalilova and young models made the two-days festival even more splendid. 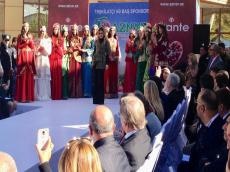 The runway show was organized by the Ministry of Culture and Tourism,Goychay Executive Power and "AzNar" company, Trend Life reported. The fashion collection was presented by models from "Venera" Modeling Agency, headed by Syama Hasanova. Stunning dresses brilliantly reflected the national culture and embraces Azerbaijani women's beauty. All with the interest looked at the original design by Gulnara Khalilova. A festive evening full of music and lots of fun will stay long in the memory.